Tales of my adventures with the incomparable Go4cycling team. Here is my 2012 plan, sadly curtailed by illness and an operation. 2013 beckons though, ever so brightly! Have I bitten off more than I can chew? Has my enthusiasm & heart got the better of my brain... and legs... and my poor wheels? Right, here goes... part 1 of the dream 2012 'single day classics' season. I'll probably aim for the 160-200 km route for each event, especially with the VIP support by Nico and his excellent Go4Cycling team... and 'The Lion of Flanders' himself, Johan Museeuw! 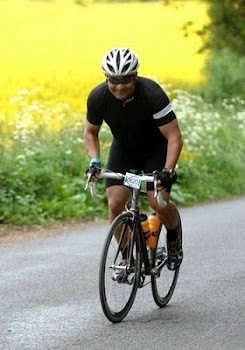 2011 saw me watch the Ronde, courtesy of a Go4Cycling competition win - see previous post - and 2012 demands I go one step further! 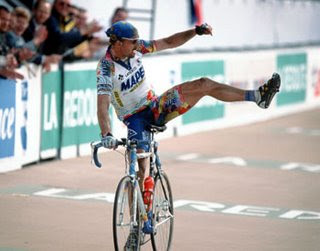 Johan Museeuw, winning the 2002 Paris-Roubaix. His second victory. If I can at all manage/afford it (DIY & home ownership is devouring my cycling 'trust fund'!) 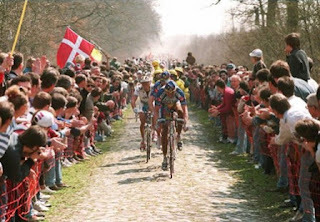 I WILL be staying for the full dream trip: Flanders week. If not, then I'll be back for Liege-Bastogne-Liege... again (an astonishing day in 2011 - see previous post) and - in support of my good friend Leslie (who is riding and blogger of the excellent 'Travels with a Tin Donkey') The Amstel Gold Race... which I may ride... it will depend on the old Dey legs! Nico, et al, has designed an excellent team kit, that I will be proud to wear (and to try my best to do justice too). It's available on the www.go4cycling.com website and not only looks great but is also a real bargin when one considers just how expensive cycling kit is becoming these days. This will be the closest I for one ever get to the professional peloton... a dream sparked in the mid 70's when my father and I 'accidentally' and rather unexpectedly found ourselves hemmed in by thousands of loud and fans watching these odd men ride very fast over lethal looking cobbles. I recall only the colourful flashes, the crazy cars and a sense of fascinated bewilderment; it was over twenty years later that I realised that I'd witnessed a small piece of the 'Hell of the North'! CLICK: For more information on the excellent service provided by Nico and his team at Go4Cycling.